Surtaxed semi-postal or charity Swiss stamps for the Pro Juventute Foundation have been issued at the beginning of December of almost every year since 1912. None were issued in 1914, due to the outbreak of World War I. Pro Juventute is a Swiss charitable foundation, established in 1912, dedicated to supporting the rights and needs of Swiss children and youth. For the same reason that the Latin name "HELVETIA" was chosen as the official name of Switzerland, this charitable foundation for children chose the Latin phrase "PRO JUVENUTE" or "FOR THE CHILDREN" as their official name. Otherwise they would have to print the name of the foundation in all three official languages of the Swiss Confederation on the postage stamps and on all their official documents. The Pro Juventute Foundation issued the three stamps shown above (Zu. WI #I-III, Mi. #I-III, Sc. N/L) on December 14, 1912. They were distributed by the Swiss postal service, but as they did not have the country name, "HELVETIA", printed on them, they were not valid for postage. As such, these stamps are referred to in the specialized catalogs as "Vorläufer" or "Forerunners", for what would eventually be the annual issue of the Pro Juventute (Christmas) stamps. These charity stamps were sold for use on holiday cards and letters, but regular Swiss postage stamps had to be used in addition to them for the payment of postage. The proceeds from the stamp sales went to the Pro Juventute Foundation. Because of the legal requirement to use all three of the Swiss national languages, three different stamps had to be issued. The 10 Rappen red brown, featured a German language legend meaning "A Lot of Sunshine in the New Year!". The 10 Centimes green, featured a French legend meaning "Sunshine and Health to You!". The 10 Centesimi red featured an Italian legend meaning "A Year of Sunshine!". The German and French language stamps also had a green inscription printed on the back of them which translates loosely into English as: "FOR THE CHILDREN / The purpose of these Christmas stamps is to fight Tuberculosis in Children". Mint, lightly hinged, examples of the German and French language stamps are readily available, and they are reasonably affordable. The Italian language stamp is SCARCE, and it is very difficult to find. Canceled stamps and stamps used on cards or letters are very scarce. All three of these stamps exist as horizontal pairs - imperforate between. They were also sold in individual booklets containing five panes of three stamps each. The booklets and booklet panes are VERY RARE and are seldom encountered. The first official Swiss government stamp for the Pro Juventute Foundation, shown above (Zu. WI #1, Mi. #117, Sc. #B1), was issued on December 1, 1913. The 5 (+5) C. stamp featured the Latin expression PRO JUVENTUTE, so multiple inscriptions or multiple stamps were not needed to satisfy the national languages requirement. The stamp design depicts Helvetia, with the Matterhorn in the background. The new stamp cost 10 C., of which 5 C. paid the first class postcard rate, and 5 C. went to the Pro Juventute Foundation. The surtax amount was not printed on the Pro Juventute Swiss stamps until the issue of 1937. The surtax rule for the earlier issues is as follows: 3 C. stamp had a surtax of 2 C., 5 C. to 20 C. stamps had a surtax of 5 C., and 30 C. to 40 C. stamps had a surtax of 10 C.
The two Pro Juventute Swiss stamps shown above (Zu. WI #2-3, Mi. #128-29, Sc. #B2-3) were issued in 1915. This issue, along with the 1916 and 1917 issues, feature children dressed in regional costumes. The 5 (+5) C. denomination depicts a boy of Appenzell, and the 10 (+5) C. denomination depicts a girl of Lucerne. The 5 (+5) C. denomination was also issued in booklets containing five panes of six stamps each. The booklets and booklet panes are RARE. Because this stamp was printed in special booklet-format sheets, it also exists as "interspace" pairs and as "Tête-bêche" pairs. The interspace pairs are rare. The Tête-bêche pairs are readily available, but they are a little pricey. The three Pro Juventute Swiss stamps shown above (Zu. WI #4-6, Mi. #130-32, Sc. #B4-6) were issued in 1916. Following in the theme of the 1915 issues, the 3 (+2) C. denomination stamp depicts a girl of Fribourg, the 5 (+5) C. denomination depicts a dairy boy of Bern, and the 10 (+5) C. denomination depicts a girl of Vaud. 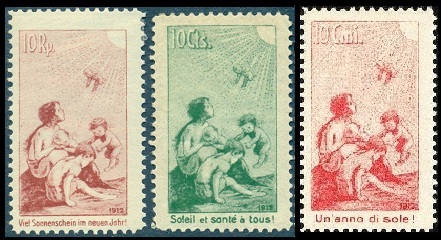 The three Pro Juventute Swiss stamps shown above (Zu. WI #7-9, Mi. #133-35, Sc. #B7-9) were issued in 1917. The 3 (+2) C. denomination stamp depicts a girl of Valais, the 5 (+5) C. denomination depicts a girl of Unterwalden, and the 10 (+5) C. denomination depicts a girl of Ticino. In 1918, the theme of the Pro Juventute Swiss stamps was changed to coats of arms, and this new theme continued though the 1930 issue. The philatelic and thematic collecting possibilities of this series is incredible. A Swiss collector would obviously collect these as part of their basic Swiss collection. This issue, the Pro Juventute charity stamps, could also be collected as a specialty, adding booklets, varieties, postal history, and first day covers to the mix. Thematically, these could be collected as semi-postal / charity stamps of the World or as Christmas stamps of the World. The issue also contains many thematic subjects within it, such as coats of arms, national costumes, famous people, flowers, plants, butterflies, birds, art, children's stories, and many more. Combined with the other series of charity stamps Switzerland releases every year during the Summer, the Pro Patria series, just collecting or specializing in the semi-postal stamp issues of Switzerland, by themselves, could develop into a lifetime effort.